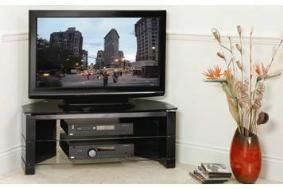 Peerless launches New York-themed range of TV stands | What Hi-Fi? The entry-level model is the Hudson, which has D-shaped shelves to save space, and comes in four sizes starting from £120. As with all the Peerless stands, the model number represents the width in millmetres. The £120 Hudson 650 is designed for 26in screens, the £140 800 for 32in models, the £160 1000 is good for TVs up to 42in and the £200 1200 60in models. Next up is the Broadway, available in two sizes, and having an adjustable middle shelf, a choice of black, red, white and silver inserts, and castors. The £200 Broadway 900 is good for 37in screens, while the £230 1100 can handle TVs up to 50in. Finally, there's the Manhattan range, designed to fit into corners. It comes in three sizes, with side panels finished in five-times painted and polished multi-layered lacquer black. The £250 Manhattan 800 supports screen sizes up to 32in, the £280 1000 up to 42in and the £300 1200 up to 60in.